Diane Shanklin is one of the all-time Ohio high school volleyball coaching legends and a member of the Wayne County Sports Hall of Fame. Shanklin won 518 matches over 33 seasons leading the Orrville program she started in 1975 and coached every year but one before retiring after the 2008 season. That run included a Div. III state championship in 2003, seven league titles, 14 district crowns and mentoring countless future Div. I players. What coaches did Shanklin have to learn from? Well, when it comes to actual coaching, drawing up Xs and Os, coming up with workouts and learning how to push players, none. “My coaches in college at Morehead State, they were really nice ladies, but they’d basically roll out the basketball or volleyball and tell us to play,” said Shanklin, who excelled in both of those sports and even bowled at Morehead State from 1970-74. “We didn’t have half the opportunities that these young ladies have today. The effects those 37 words have had on possibilities for women in education have been staggering, with the number of medical degrees compared to men, for example, going from 9 percent in 1972 to 48 percent in 2010. However, the athletic improvements that followed have been astronomical. To help celebrate the 40th anniversary of Title IX this summer, The Daily Record hosted a panel discussion with four women whose combined playing and-or coaching careers have spanned all four decades of Title IX. Shanklin was joined on our panel by Cheryl (Shane) Koch, who was on Norwayne’s first volleyball team in 1975 and also starred in basketball; Jen (Maibach) Snowbarger, a three-sport Wooster High athlete who went on to play volleyball at Kent State and now coaches the Generals; and Orrville senior Hannah Plybon, a volleyball, basketball and track athlete who’s verbally committed to accept a hoops scholarship to the University of Akron. If the women thought Shanklin had it rough at Morehead State, they shook their heads even more when she described the Ohio high school basketball rules when she played for Lakota from 1966-70. “Two girls had to play just defense, two had to play just offense and two players were allowed to go on either side of the court,” Shanklin said. 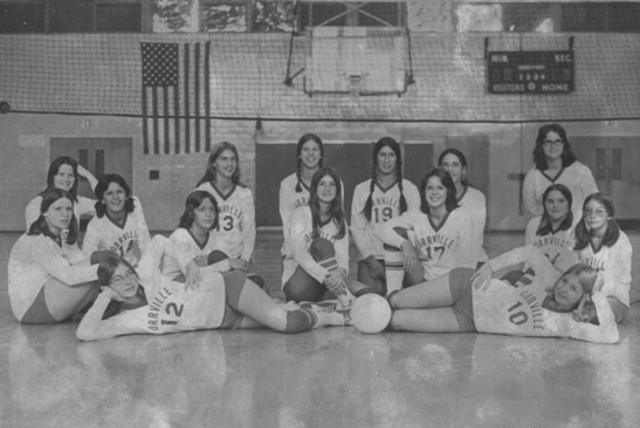 1975-76 Orrville Yearbook photo Orrville High School’s first volleyball team poses for a photo. The Red Riders consisted of (front, from left) Sue Bottomley, Jill Hostetler; (middle) LeeAnn Davidson, Lori Stuckey, Michelle Maag, Lauri Brillhart, Arlene Linhoss, Melinda Budd, Annette Dalessandro; (back) Teri Yoder, Cheri Amthor, Annie Thomas, Denise Purdy, Marty Preston and Pat Dalessandro. Coach Diane Shanklin’s team started with a humble 1-4 record — for the entire 1975 season — but the coach went on to lead Orrville to 518 overall wins, seven league titles, 14 district crowns and a 2003 Div. III state title during a 33-year hall-of-fame career. Plybon cringed when asked about the girls style of basketball when Shanklin played. 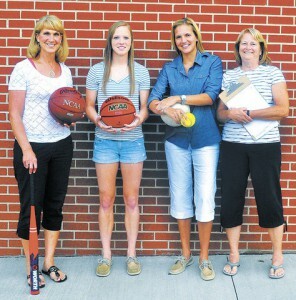 “I knew the rules were different,” said Plybon, who’s on track to become the Red Riders’ all-time girls scoring leader. “There was no 3-point line and there’s a lot of changes. Prior to Title IX, girls in Ohio played organized interscholastic high school sports from around the 1920s to 1940, when a referendum led to the discontinuation of girls athletic programs. Sports were determined at that time to be too grueling for women and even considered unladylike by some. It wasn’t until the 1960s that widespread participation for girls interscholastic teams would return, and state volleyball and girls basketball tournaments weren’t held annually until 1975-76. While women’s sports are as popular as ever today, the passage of Title IX didn’t mean they shot into the fast lane of support and acceptance. Koch, who Shanklin ranked with Lisa Cline (West Holmes) and Keri (Simmons) Hamsher (Orrville) among the best female athletes she’s seen in this area, was a junior at Norwayne during the first school year the OHSAA had state tournaments for girls basketball and volleyball. 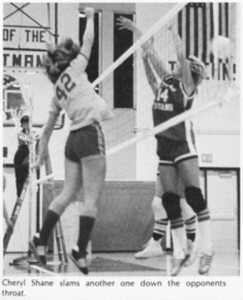 “It was so much different from right now because we only played every Wayne County school, if they had that sport, one time through,” said Koch, whose daughter Kara is a second generation Title IX product who’s a volleyball star entering her senior year at Cleveland State. “My junior volleyball year we only had seven games the whole season and my senior year we had 11. As far as support goes, the coaches, players and parents were about it in those early years after Title IX passes. Norwayne made the most of the first year for the OHSAA postseason volleyball tournament in 1975, advancing to a regional final under coach Anna Syrios, who passed away earlier this summer at age 86. “We didn’t even know there was going to be a tournament (before the season), we were just happy to have the chance to play volleyball,” Koch said. Shanklin, who also coached Orrville’s girls basketball team in the 1970s recalled the team having to practice at 9 p.m.
“We got the gym after the boys varsity, JV and freshmen, and they even let Wayne College’s men’s team use it before us,” she said. So how did she become successful? Proof of how far women’s athletics had progressed by the time Snowbarger reached high school in the 1990s, and Plybon’s career began in the 2000s, is that those early hardships seem like distant memories. Although there are still some improvements that panel members would like to see, Snowbarger said that today girls teams receive fair practice times, more experienced coaching and lots more community and media support. Now, it’s a matter of fine-tuning things to make the women even better at what they do, Snowbarger said. “Through the years, athletics in general have changed,” Snowbarger said. “As an athlete playing three sports — the demands of it and what coaches did in the offseason was so different from today. “The expectations and level of play — what Hannah’s playing in now compared to when I played in the 1990s — volleyball is almost a different game in terms of the speed and the demands. They’re definitely improving the game.